A/B testing is way of comparing and testing two different options. For example, let’s say you have a job ad that’s not performing well, we’ll call that “job ad A”. You then make a small change to the job ad, like changing the hero photo, and this new job ad becomes “job ad B”. You can then compare the results of both job ad A and job ad B to figure out which version is more successful. A/B testing will help you to optimize your campaigns and reach candidates more effectively. As the unemployment rate continues to decline, the number of passive candidates continues to rise. Candidate sourcing is the perfect strategy for reaching passive candidates who aren't actively searching for a job. By contacting them directly, you can begin to build a relationship in the hopes of hiring them for a current or future open position. Events are becoming increasingly important in the field of recruiting. They are a great way to get to know candidates in person and create a more personal relationship. They also help you to stand out from the competition and emphasize your employer branding. 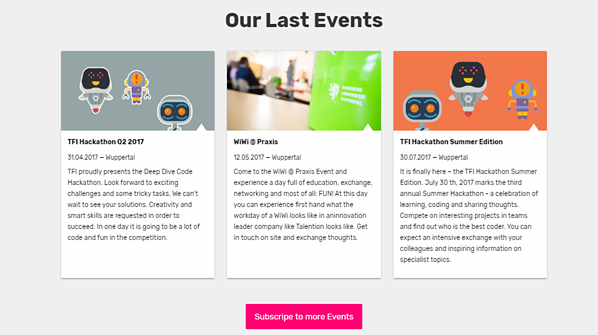 They don't have to be boring networking events either, why not try something new like a Hackathon? Alongside of hosting events, having a talent pool has become an essential part of a successful recruiting strategy. Talent pools are particularly significant for two main reasons. First, they are the easiest way to gather candidates' data securely and also in an organized and searchable way. Second, a talent pool creates a pipeline of candidates who are familiar with your employer brand and can be recruited for future open positions. Landing pages help to address specific target groups or other parts of your recruiting process. They will help you to improve your SEO and also provide candidates with more specific information. For example, if you recruit a lot of students, it may be beneficial to have a landing page with information specifically for student applicants. 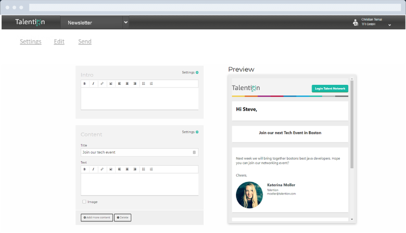 You could also have a separate page to highlight your recruiting events or your talent pool. Once you have candidates in your talent pool, it's time to nurture them. Candidate nurturing is a way to stay in regular contact with candidates, for example via email campaigns or newsletters. By staying in touch with them, you can keep them active and familiar with your company and employer brand. This will ultimately make them easier to recruit for future positions. Do you want to learn more about the top HR trends of 2019? 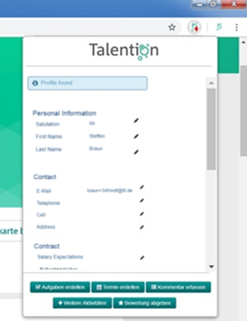 We will gladly show you further examples in the Talention software. Request a demo now and someone will get in touch with you shortly.